Wael Ghonim (made by the media a hero of the Egyptian revolution) is growing more ridiculous by the minute. He said an audience in Oslo he’s “optimist, very optimist” about Egypt’s future. It’s not that everything is lost there, but he’s ignoring a reality of harsh repression. He didn’t even mention his fellow blogger Ali Abduleman, who was invited to talk in the same forum but disappeared! Wael Ghonim, a quien algunos medios convirtieron en héroe dela revolución egipcia, se hace más ridículo cada día que pasa. Le dijo a una audiencia en Oslo que se sentía “optimista, muy optimista” sobre el futuro de Egipto. No es que todo se haya perdido allá, pero está ignorando una realidad de represión brutal. Están desapareciendo, por ejemplo, a sus colegas blogueros. Uno de ellos, Ali Abduleman, debió haber participado con Wael en el foro, pero desapareció tras recibir la invitación ¡y Wael ni siquiera lo mencionó! Tal vez Wael está demasiado ocupado para pensar en Abduleman. Acaba de firmar un contrato para hacer un libro que se llamará “Revolution 2.0”, explotando una exageración que él conoce bien. Como muchos periodistas deseosos de vender ejemplares, está usando la idea de que se trata de “revoluciones Facebook”, lo que en realidad no es más que mercadotecnia. Otra bloguera, Maryam al Khawaja, le replicó: “Como alguien vuelva a decirme que las revoluciones árabes son posibles gracias a Twitter y Facebook, le mato”. 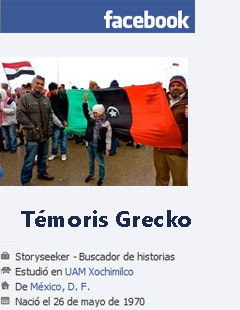 Témoris Grecko At the end of the day, Wael is another Google product. His stated concerns about Egypt are about the economy and he’s marketing Egypt for tourists. Which is alright, I myself did the same here. But mate, they’re killing and torturing and disappearing people. The army is still in power and they won’t let it go to the citizenship. I think my friends Al-Shimaa’ Haidar and Amr Fekry would agree. A final de cuentas, Wael es otro producto Google. Sus preocupaciones declaradas tienen que ver con la economía y está vendiendo Egipto para que regresen los turistas. Eso no está mal, yo mismo lo he hecho aquí mismo. Pero, colega, están matando, torturando y desapareciendo gente, a la gente de la revolución. El ejército sigue en el poder y no lo va a entregar a la ciudadanía. Creo que mis amigos Shimaa y Amr estarán de acuerdo. Témoris Grecko Note: at the beggining of the revolution, Wael was Google’s head of marketing in the Middle East and North Africa. Témoris Grecko Nota: al principio de la revolución, Wael era jefe de mercadotecnia de Google para el Medio Oriente y África del Norte. This entry was posted in All English language scribblings, Blog shots / Breves del blog and tagged Egypt. Bookmark the permalink. I don’t know why people think Egypt has ‘changed.’ The Army has run Egypt ever since Farouk got chased out by Nasser in the 50’s. It runs Egypt now, and will run Egypt once the ‘transition’ is complete. Sad to say, but it is what it is. It also will happen without anyone noticing. After the big party on 02/11, the world packed up and left. I will be very interested in seeing how these elections play out. Everyone’s worried about the Brotherhood but they strike me as more Sinn Fein than IRA at this point to use Irish analogy. But nobody worries about the entrenched apparatus that will come out on top no matter what. And that entrenched apparatus has killed far, far more Egyptians than the Brotherhood, and will continue to do so with near-impunity. Wish I could be more of an optimist, but I don’t see how things will work out differently. Cris Pagès Boune ¡Bien por Maryam al Khawaja! ¡Triste en lo que ha derivado lo de Egipto, no sólo por los egipcios, sino por todos los demás pueblos insurgentes que creyeron en la posibilidad de un cambio radical. Parece mentira que alguien que supuestamente era revolucionario sea capaz de OCULTAR tan cínicamente la verdad, porque no creo que no la vea. Al-Shimaa’ Haidar I started to hate him literally, we have around 10,000 detainees in military prisons mostly people my age facing military trials and nobody cares for them or talk about them. Our revolution is being killed by the army and the old regim and they are sucessful in it while Wael is travelling aound the world promoting his book and torism. Who is going to visit a country where army is arresting and torturing the people who started the revolution?! Cris Pagès Boune Probably those who have kept the image of a victorious revolution and those who don’t give a damn. Don’t know what to say Al-Shimaa, we’re far away, we’re not suffering what you people are suffering, it seems easy for us to protest, etc., but then, that’s what we CAN do. We are with you. Larry Roberts Give us your best guess on what is happening in Egypt and the prognosis. I have these varying thoughts. First, is this a temp situation? Is there a time frame for unrest, theft, and murder? Will the young people you were beside during the revolution take control once again? Will anarchy reign supreme or will it run its course? I know you can only give a best guess, yet I want to hear your thoughts and feelings. Larry Roberts I just want you all to understand and to the extent possible, take pride in your unselfishness and desire for “happiness.” There are many of us older humans who support you and your oft fearlepursuit of freedom. Via la revoluchian.